The film “Concussion”, starring Will Smith as Dr Bennet Omalu, hits the theatres on December 25th. 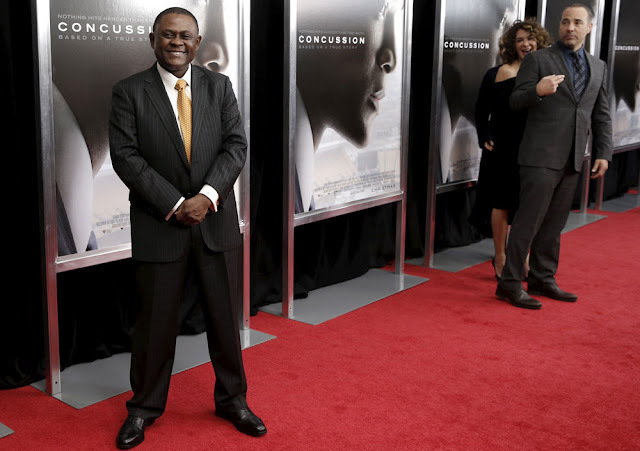 Concussion is a David vs. Goliath story of Nigerian-born forensic pathologist and neuropathologist Dr. Bennet Omalu, who made the first discovery of Chronic Traumatic Encephalopathy (CTE), a football-related brain trauma, in a pro player. It was the autopsy of Pittsburgh Steelers center Mike Webster led to Omalu’s discovery of CTE. The biopic film also stars Nigerian-British actor Adewale Akinnuoye-Agbaje who stars as former Chicago Bear player Dave Duerson – who in 2011 committed suicide at the age of 50 so that his brain could be left to researchers studying head injuries among football players and the connection to CTE. The real Dr Omalu is currently the Chief Medical Examiner, San Joaquin County, California and a professor in the UC Davis Department of Medical Pathology and Laboratory Medicine. In an interview with the Christian Post, Dr Omalu said that he believed he was the "wrong person" to have discovered this problem - implying that God often uses unlikely people to change the world. His research led to his discovery but it was his faith that compelled him to be bold in the midst of great opposition. "Through Will Smith, you see glimpses of my faith in the film/ My faith in God and belief that God calls us to be strong and courageous," he said, crediting his faith for giving him the courage to confront the dark secrets of concussions in the NFL.